Today we’d like to introduce you to Cliff Harris. Thanks for sharing your story with us Cliff. So, let’s start at the beginning and we can move on from there. 18 years ago, my brother and I began a youth wrestling program in West Georgia. The program grew to well over a hundred young youth athletes, and the owner of the Sportsplex at the time sponsored our program, and provided the place for us to practice. Since then, we re-established wrestling at the local Carrollton high School, and have seen several of our wrestlers go on to wrestle at the collegiate level, while the youth program has prospered in West Georgia. The owner back then was ready to close the fitness center, after having managed it for 20 years at that point, and 14 years ago my brother and I, along with another partner, purchased the business. We purchased the real estate, and upgraded the 30,000 Square foot facility, which includes an indoor saltwater heated pool, indoor racquetball, Silver Sneakers Fitness programs for seniors, and a variety of fitness training programs suitable for individuals and families to improve the quality of their health and fitness We have remained very connected with the local youth, and school systems, as well as the community, and are proud of the impact we’ve been able to contribute to the wellness of our local community. My brother and I are Army Veterans, and our partner has a son who has served in the military as well. We’re partial to our local veterans, and have an incredible team on staff to run our day to day operation. Owning the real estate has provided a real advantage to the business, as there is substantial leverage and equity there, enabling options as business owners. The advantages of owning the real estate far outweigh the challenges that come with property management and ownership, but they are there and there are challenges when it comes to property management. There are other fitness centers in the area, keeping us sharp, as well. Alright – so let’s talk business. 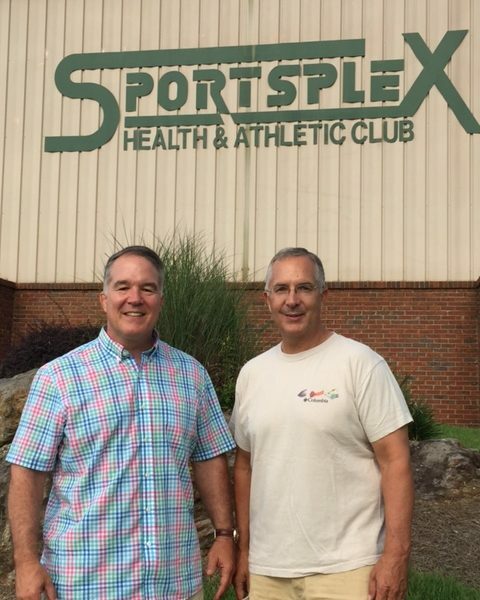 Tell us about Sportsplex Health and Athletic Club – what should we know? What sets us apart is our local engagement with the community, with members who have been anchors in our fitness center across the past 34 years. The brand is local, and well recognized, and we have an incredible team of personal trainers, program directors, and a General Manager, Sherry Wilson, who runs our operation day to day. We offer a variety of Ball Room style dance lessons seasonally for the community, and wellness programs such as diabetes and nutrition classes with certified dietitians, for all age groups. My partners and I have been very engaged in coaching our local youth, from wrestling to soccer, little league baseball, and recreation football, and we are very active members in our community church organizations, and school booster clubs. We live here, and have raised our families in this special community, and are very serious about providing a well-rounded fitness offering that has a local historic brand recognition. My nephew worked out here in his youth, as well as working on staff (as have all of our children at one point) and is now the Long Snapper for the Atlanta Falcons, in his 6th Season, #47, Josh Harris. We’ve had great mentors along the way, to include leaders during our time in the military, and expertise that we’ve been able to lean on. My wife is an accountant, and a very good one at that. She manages the finances, and keeps us straight in that regard. The team that runs the operation, from our General Manager, Sherry Wilson, to our staff who open at 0500, and close at 10PM, Monday through Friday, along with weekend staff, and our maintenance personnel who keep the building and equipment running and operationally efficient. Our Program Directors, Julie Stubbs and Kristen Limbaugh, are top notch, highly trained fitness champions who deliver a broad and relevant group fitness offering. One of our Personal Trainers, Glen Barry, has been a personal Trainer at the Sportsplex across most of the past 30 years. These are the champions and the back bone of the success of our operation, along with our loyal customers. We’ve engaged West Georgia College Business school for specific internships to assist with specific business needs, such as targeted social media marketing and brand promotion and advertising. Been a member for almost 30 years. Great place to workout and the staff is great. I have been a “Silver Sneaker” participant when my work schedule allowed me to. Sherry , the VERY best manager in the world, really kept me coming back. I use the pool and really enjoy the water aerobic classes and instructors. Thank you for having such a great manager and a clean, welcoming place to go. I look forward to retiring and going on a more regular schedule.